People often ask us “Do you do client work? I have this great idea!”. We literally get that several times a week. The answer is yes, but we are not interested in your idea. We are looking for people who don’t just have an idea, they have a business plan, they have their budget sorted and they have the passion required to transform an idea (the first 1% of the work required) into a product (the other 99%). People we can form a partnership with to bring something truly innovative and useful to the market. I am interested in having an iPad app developed for use by farmers as an in-paddock record keeping tool. 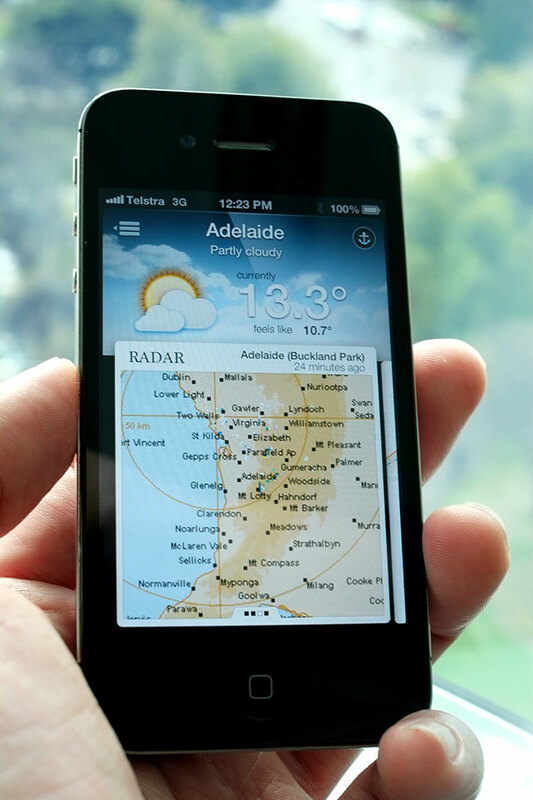 I would like to work with a South Australian based company to develop this and found your website from a google search. Can you please let me know what information you would require to provide a quote and timeframe for developing an app? The best thing about this email? Rebecca didn’t ask us to sign an NDA before uttering a word about her idea, but instead gave us a really high level explanation about what she wanted. People who believe that ideas are incredibly valuable, and can be stolen in seconds are a topic for another day (hint: they are not and they can not). So long story short Rebecca came in, we talked about her idea, and then laid out a roadmap for how to bring her idea to the store. It was clear from the beginning that Rebecca had already put a lot of thought into her app, and the business around it. She had mockups of screens, notes about ideas, and questions all ready to go. The takeaway? If you want to bring an app to market, you have to be prepared to put in the hard work. To research, to think things through, to organise the finances required. Then you have to find yourself a team of developers that you’re comfortable working with, that want to see you succeed and that, most importantly, you trust. You also have to be a bit flexible, the more Non-Disclosure Agreements and restrictive contracts you sign, the worse the outcome is going to be. The clients thoughts on the project? I just want to say thank you so so much for all your enthusiasm, hard work and assistance in getting this app into the market. Whenever I tell people I’m getting an app made they always ask how the hell do you do that. My answer is always the same – I googled app developers and very wisely chose the coolest and most skilled boys in the business. Finding you was a dream come true and the whole process has been stress free and an absolute pleasure, something that is very rare for a start-up independent business I’m sure you will agree. So Rebecca: we really do wish you all the best with your app and hope that you get the success you most definitely deserve. Working with you was a pleasure, and we’re really proud of what we have built together. If anyone out there knows of any farmers that would be interested in what Rebecca and her company have to offer, be sure to point them to her Rustic Evolutions home page, and her brand spanking new EvoCrop app. Welcome to 2012, and goodbye to January…where on earth does the time go! This is the first year we’ve sat down and actually planned the year ahead. It’s been quite an exciting task and today we thought we’d share a little bit of that planning process with you. Nothing is guaranteed of course, we’re not exactly renowned for sticking to deadlines, or plans, so we’ll see how it goes. Our New Website Click Me Click Me! 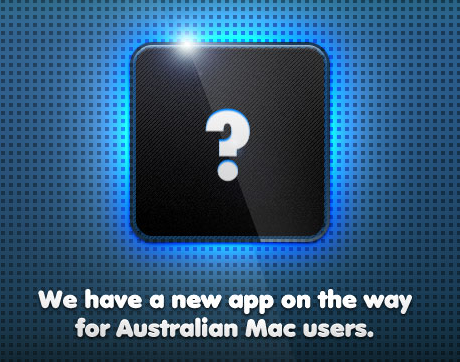 That’s right, we’ve been working on a brand new Mac app. No details yet, we’ll just let you marvel mysteriously. But of course it wouldn’t be the Official Year of Shiny Things (why yes, I did just make that up, thanks for asking) if there wasn’t more than just those two things, and there certainly is. 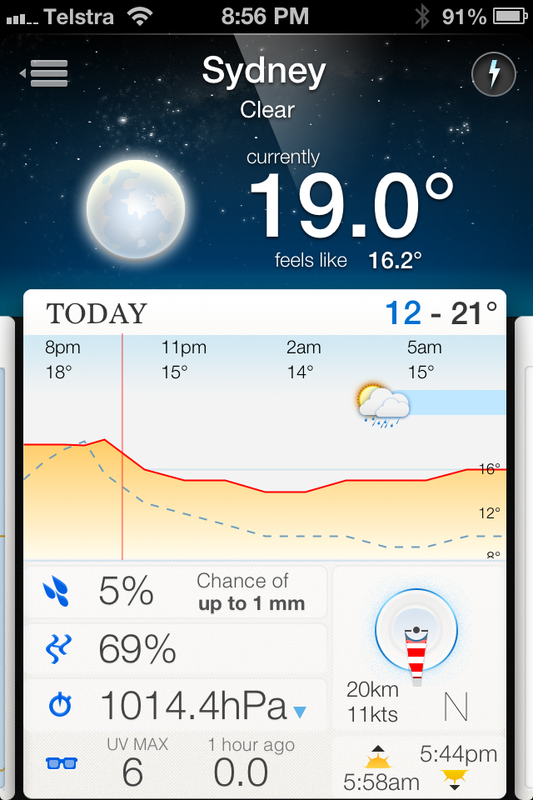 We plan on making some very big changes to our existing iOS apps, as well as our Android apps. This is the first year we’re going to turn our Android development into a first class experience. What we’ll be striving for is an equal (or better!) app experience on our Android apps in comparison to our iOS ones. Bonus 1000 points if you read all the way to here. Points are redeemable for more points in future. 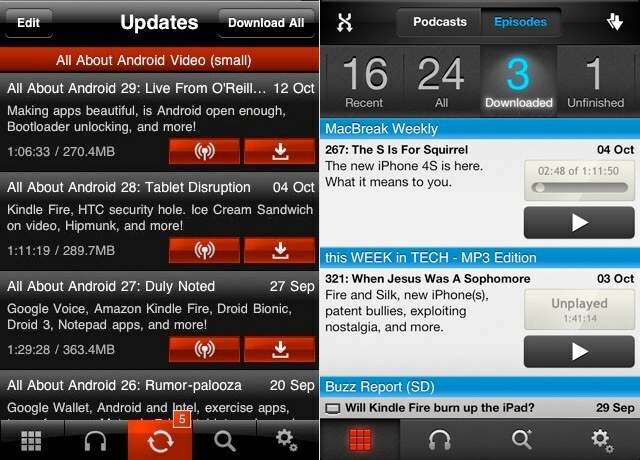 Over 3 months ago we took a long, hard look at Pocket Casts. It was by far our favourite app, yet it was selling really badly. So we had a decision to make: let it go and move on to something else, or double down and work on making it better. We loved it too much to let it go, I for one use it twice a day, if not more. So we made a decision that’s not easy as a small developer with very tight cash flow…we decided to spend whatever it took on getting the app right. ‘Whatever it took’ turned out to be 3 months. That’s a huge risk, but we think it was worth it. The first thing you’ll notice when you open version 3.0 is that everything has changed. The look, the feel, the flow of the entire app. There are many reasons for this, but the main one for us was always about making the app more usable and more friendly. For long time users of our application, we realise this can be quite jarring at first but give it a few days we think you’ll love it. We can’t explain every single change we made, but we’d like to cover a few. The way it works now is that episodes that you’re phone has found out about recently, appear in the ‘recent’ page. Downloading them leaves them there, but also places them in the ‘downloaded’ page (which also flashes briefly when you download something. This makes it clearer where your podcasts are, and how to get to them. Another new feature is that the app will now download 2 podcasts at once, which is handy when one podcast authors site is screamingly fast, while the other is slow. Pocket Casts is the only podcast application for iOS (as far as we know) that does all its podcast processing on a server. What this means is that when your phone needs to see what’s new, instead of downloading individual podcast feeds (which can be very large), it just calls our server once “hey what’s new” it says. “Here are 3 episodes that are new since the last time you checked” says our server. That’s about 10kb’s worth of data, vs potentially many megabytes worth. Also worth noting is it’s a lot faster. Pocket Casts took 1 second to refresh all 27 of my podcasts. Our competitor took almost 2 minutes (105 seconds). That’s about 70x longer. It’s worth noting here that I could have been really mean and added 100 podcasts. 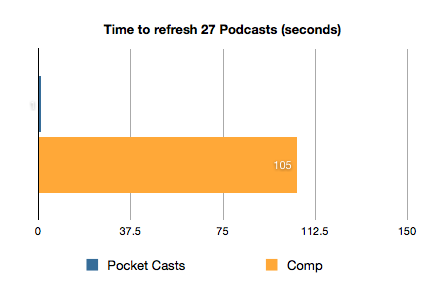 Pocket Casts would still do those in 1 second, while the competing app (without a server) could take up to 10 minutes. It’s not rocket science, their app has to go off and look at every single RSS feed for every single podcast and see what’s new. That’s where our server comes in, it refreshes podcast feeds at a rate of about one million per day! All this so that your phone doesn’t have to. 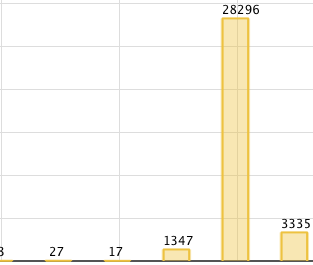 Time aside, I decided to monitor the data use. 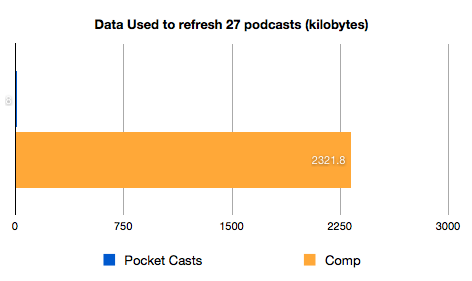 To refresh 27 podcasts Pocket Casts sends 5kb to our server, and receives 3kb, for a total of 8kb. That’s tiny. 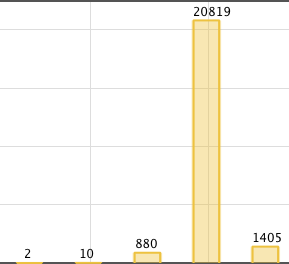 The competing app sent 69kb and received 2252kb for a total of 2321kb (2.3 megabytes). 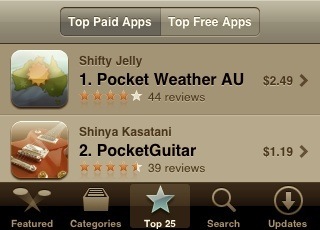 In this case the competing app uses 290x more data than Pocket Casts. Note that we’re not deriding our competitor in any way, you can’t do any better than that, since you have to parse the feeds from the phone. That’s why we designed our app to have a server, because we wanted fast refreshes with minimal data use. And not just any old server, we currently run 11 high-end servers, that plow through many, many gigabytes worth of data each and every day. Yes, we do take this very, very seriously. You can now opt to receive text notifications, along with a sound when new podcasts are released. 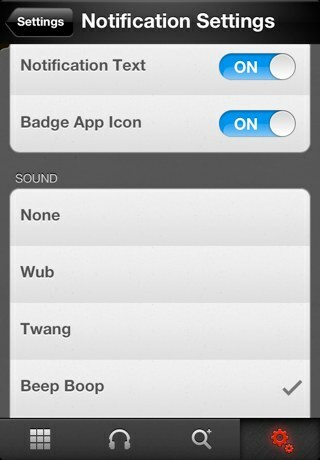 You can even turn this on or off per podcast, if you like some more than others. What it means is that you’re always notified about what’s new, even if you have the app closed. The old now playing screen was ok, but there were a few things that bothered us. Firstly the progress bar was too close to the top of the screen, which didn’t work well with iOS 5 and its new notification pull down. Secondly the controls were a bit small, and felt cramped down the bottom. Lastly there didn’t seem to be any consistency as to how we placed these controls on the page. In the new version we’ve fixed all that, while retaining the ability to see all the podcast artwork by tapping in the middle of the screen. The show notes are now much more accessible as well, just swipe to the right to see them. We also download the show notes when the podcast is downloaded, so no more having to have an internet connection to read them. On the list screens, you can now see exactly where you are up to in each podcast (and it updates if the podcast is playing) as well as being able to pause and play right from those screens. 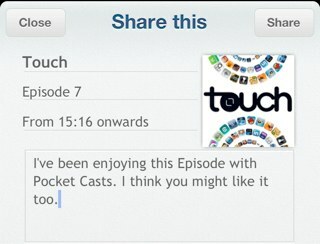 Lastly (and this is one of our favourite features) you can now start playing a podcast while it’s downloading. If you listen to a lot of podcasts like we do, then you can quickly become overwhelmed with having to manage them. Deleting old ones can especially turn into a chore. 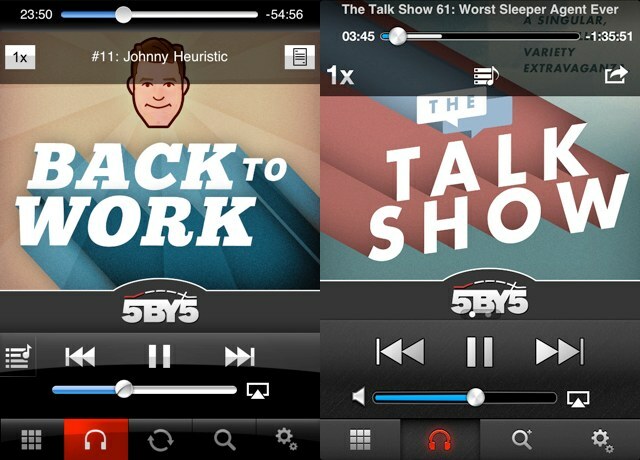 With the new version of Pocket Casts, we now let you configure how many old episodes you’d like to keep. You can do this for all your podcasts, as well as each one individually. So in my case I tell it to keep the last 3 Tech News Todays (a daily show), but only the last This Week In Tech (a weekly show). You can also ‘star’ an episode if you want to make sure it never gets automatically deleted by the app. 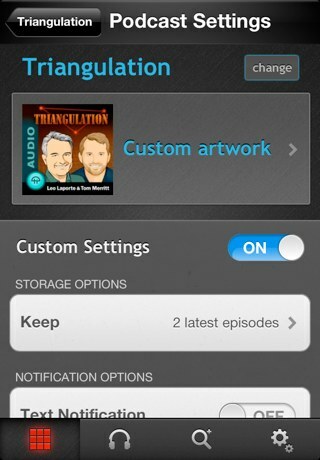 Now you can change the name of a podcast, or its artwork at any time. We may have accidentally also created a way to listen to more…how shall we say…’risque’ podcasts with this feature, but that wasn’t our intention. Honest. Another great new feature of Pocket Casts v3.0 is the ability to share your podcasts, episodes, or even the position in an episode with other people. This means if you’re really liking a podcast, or an episode, you can recommend it to a friend in a few simple taps. When you tap on an email, tweet or website with this sharing link in it, you can open that straight from your phone, and it will launch Pocket Casts, and let you choose if you’d like to listen/subscribe. When we release version 3.1 for Android, you’ll even be able to share with your friends on the other side of the fence. 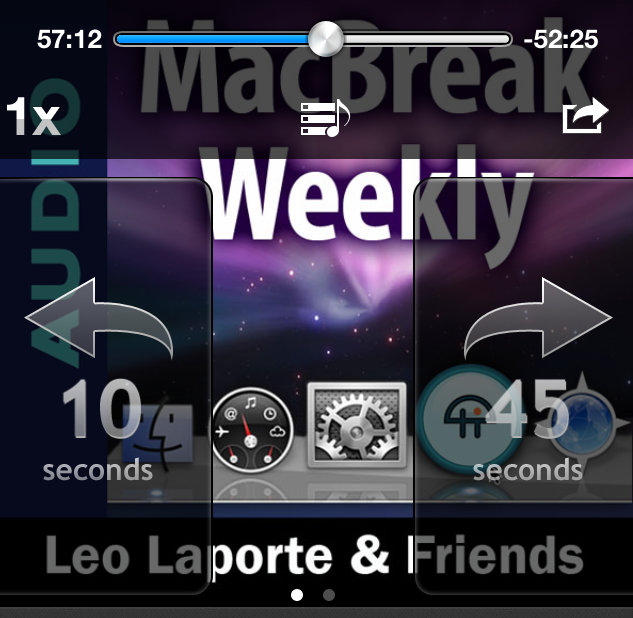 You can stop an episode from playing (or streaming) by long pressing on the now playing tab icon. You can now add videos into your playlist as well. By default they’ll play as audio, but one tap and you can be watching the video instead. 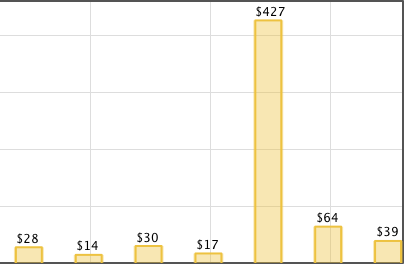 About 3 months ago, we set off on a little experiment into the world of the Amazon App Store. Back then people were hailing it as the solution to the problems with the Google Market, industry pundits like Andy Ihnatko called it ‘An Excellent Work in Progress‘. As you may already know, the Free App of the Day offer placement is one of the most visible and valuable spaces on the Amazon Appstore. We would like to include your app “[name removed]” in our Free App of the Day calendar. We have seen tremendous results from this promotion spot and believe it will bring you a great deal of positive reviews and traffic. It is an opportunity to build your brand especially in association with a brand like Amazon’s. 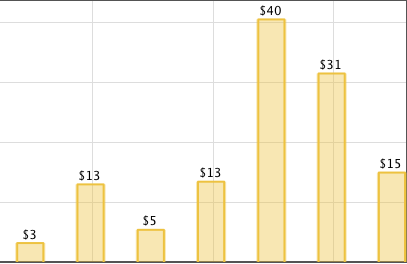 The current price of this placement is at 0% rev share for that one day you are placed. Thanks for emailing us. 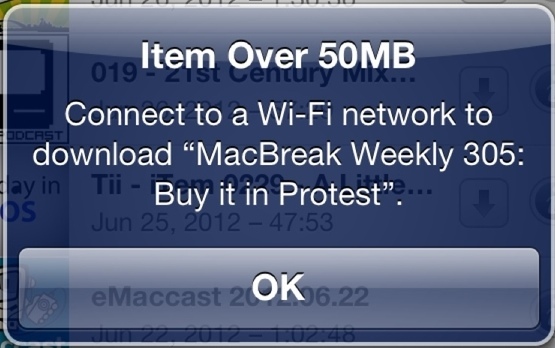 If I read this correctly you’d like to give away our application for free, and pay us nothing? That’s very generous of you, but we like being paid for our work. I appreciate that Amazon is trying to build up it’s store, and get more users, but the problem is at the moment you have the reputation of being ‘The place where I get my free apps’ and for a developer like us who doesn’t put advertising into our applications, that can only be a bad thing. We’d be happy to reconsider if you decided to pay us the 20% that we agreed to in our original developer agreement, but this new one seems to favour only you, at the expense of us? Thanks for your response. 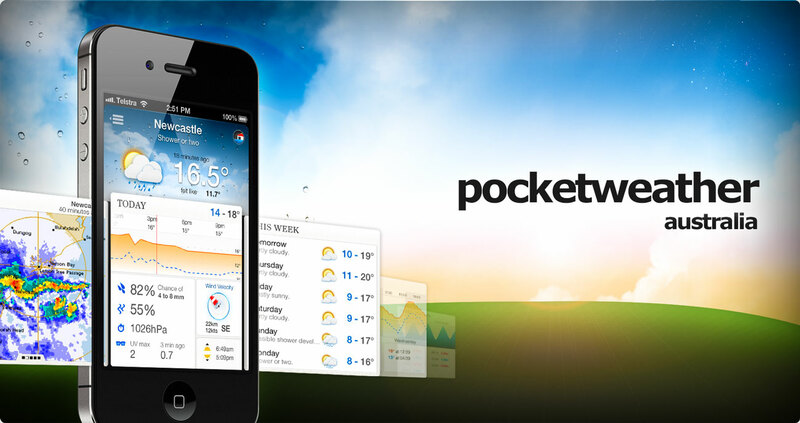 The Free App of the Day promotion is the most valuable and visible spot in the store. It hosted the launch of the likes of Angry Birds Rio, Plants v. Zombies and more. Amazon will not receive any sales rev share from the Free App of the Day; and in fact, with as the Free of the Day for one day, you will receive a subsequent Appstore main page placement for the following 14 days. 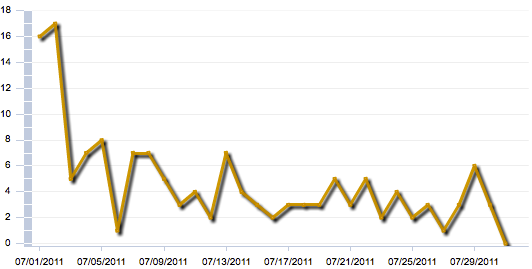 That’s right, Amazon gave away 101,491 copies of our app! At this point, we had a few seconds of excitement as well, had we mis-read the email and really earned $54,800 in one day? We would have done if our public agreement was in place, but we can now confirm that thanks to Amazon’s secret back-door deals, we made $0 on that day. That’s right, over 100,000 apps given away, $0 made. Did the exposure count for much in the days afterwards? That’s also a big no, the day after saw a blip in sales, followed by things going back to exactly where we started, selling a few apps a day. In fact Amazon decided to rub salt in the wounds a little further by discounting our app to 99 cents for a few days after the free promotion. All we got was about 300 emails a day to answer over the space of a few weeks, that left us tired and burnt out. For all we know most of the people who wanted our application, now have it. To add insult to injury Pocket Casts relies on a server to parse podcast feeds (allowing instant updates on your phone), and all these new users forced us to buy more hardware just to meet demand. Hardware that we are going to have to support indefinitely at our own cost. Update: (and this one surprised us) you can’t remove apps from their store! You have to ask them for permission via an email. Every other store lets you remove apps from sale. Add these things up, and we were starting to ask ourselves, why on earth are we in business with these guys? We can see the counter argument here, that we agreed to Amazon’s terms, even if they were underhanded and secret, so we deserve everything we got. Perhaps. I guess it’s just lucky for us that this was an experiment, and that we don’t make our full time income from selling Android apps, but rather from developing for iOS. That said, we want to make a clear stand here, so that Amazon doesn’t take advantage of those less fortunate than us. So today we’re making a stand. Effective immediately we are removing ourselves from the Amazon Store. We’re not the only ones doing this.